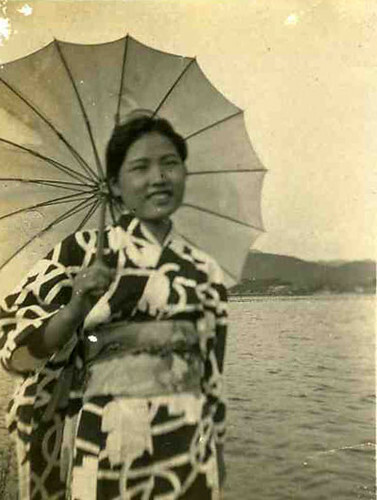 The young Japanese woman in this outdoor portrait appears very happy as she poses holding her higasa sun parasol before a large body of water. This small, original old photograph is in fair condition with some scratches, stains, fading and discoloration. The photo appears to have been previously mounted in an album as there is some torn paper from the album stuck to the back of the photo as well as at the corners. The photo dates from the mid 20th century and was acquired in the historic city of Shizuoka, Japan near the foot of Mt. Fuji.